ALL SENTENCES, QUOTABLE QUOTATIONS, STATEMENTS, THAT ARE PUBLISHED HERE ON THIS PAGE ARE COPYRIGHT PROTECTED. ANY ABUSE MAY YET BE INVESTIGATED AND WHAT NOT! YOU HAVE BEEN WARNED! the freedom of others are neither wise nor free!" as quoted by George Soros, 2007. "Weird is what makes America great!" as quoted by an anchorwoman at WBAL-TV News, Baltimore, 1993. "Sometimes to get to the other side, where the grass is green, one must first find an island in-between!" JP Fenyo, The Free Advice Man. "Actually; most people FAIL because OTHER people FAIL to HELP them SUCCEED!" Jean-Pierre Ady Fenyo, The Free Advice Man. "I KNOW what You really think about me based on what You don't say and/or don't do! And You think I am fooled, because I am kind and patient enough to await the day You come to really Respect Me!" JP Fenyo, TFAM. - Jean-Pierre Ady Fenyo, Philosopher of Ethics. "Most things we can imagine; nature already has!" Jean-Pierre Ady Fenyo, Scientific & Spiritual Philosopher, Philosopher of Ethics, and of INFINITOLOGY too! "Without Bees we would not Be!" "Anarchists are as dangerous as Fascists! They deny YOUR rights in the name of Peace and Prosperity and end up giving US War and Famine!" "I know a little about Everything in General and hardly anything about Anything in Specific. That said: One can Know The Most Essential Things One Needs To Know in order to Become Relatively Wise! As for G8D Knowing Everything: G8D, in the Sense that Baruch Spinoza and I Understand G8D's Eternal BEINGness, is unable to know things ABSTRACTLY...hence unable to know any details...BUT G8D does KNOW INFINITY ITSELF and G8D IS LOVE...that ultimate Sense of Universal UNIFYING BEINGness that WE are all part of EVERYWHERE throughout INFINITY! And that is one IDEA I know without doubt! Hence: Open-Mindedness is Essential To Wisdom, and it is not Narrow-Mindedness to KNOW A FEW GENERAL THINGS FOR CERTAIN! Otherwise there would be no point in KNOWING at all!" Jean-Pierre Ady Fenyo, Philosopher and Falafel-fer. ‎"Each and Every One of US is infinitely Unique! Live Up to Your Self!" "The True Genius does not compete with anybody and knows that anybody who tries to compete with them is not yet a True Genius!" - JP Fenyo, The Free Advice Man. "Truly Sensible Capitalism CAN ONLY WORK if it is Truly Ethical, Quality-Oriented and Sustainable. Sustainable Capitalism is Social-Democracy! Without Truly Sensible Capitalism there is no Freedom, Liberty & Justice!" Jean-Pierre A. Fenyo, Philosopher & Writer. "IF you've got nothing truly wise and/or intelligent to say then don't get in the way of those who do!" ‎"The NOW that was is NOW the THEN that was!" "When people are insecure about other people being different they tend to feel justified in persecuting them! They don't like it Vice-Versa! Jean-Pierre Ady Fenyo, The Original NYC Free Advice Man. "My Not-So-Secret Motto: IF it really is the truth then be sure you can afford to tell it!" - JP Fenyo, The Free Advice Man. "Most Conspiracy Theorists are themselves victims of a Greater Conspiracy devised by Violent, anti-Unity-in-Diversity, Anti-Social Fascists & Anarchists." "Those who have nothing better to do should do nothing"
"A seriously good artist is one who admits to making occasional crap. Bad artists think all their stuff is great." JP Fenyo, Artist and much more. infinity is the most important thought!" "The Most Important Thought" (1994, 2004). "A Revolution that is without Ruthlessness is an Evolution!" JP Fenyo, Philosopher. "G-D is LOVE! Our Common Soulness is a Part of G-D! LOVE is Indestructible & Eternal! There is a Physical Universe and a Spiritual Universe and they are Side-by-Side and where the two touch is LIFE! LIFE is Imperfect; as the Body Decays, but The Soul Remains For Eternity! Evil is the Ignorance born of the Failure to Sense and Apply This Truth! Think about this! THINK!" "IF somehow you actually owned all the Money in the World it would be Worthless!" our shadows are of the same shade." to Amiri Baraka, a.k.a. Leroy Jones, 1985.
to Ted Turner, Washington, D.C., 1994. Jean-Pierre Ady Fenyo (before becoming The Free Advice Man) to Jean-Michel Basquiat at The Pyramid Club, New York City, 1983. "A truly noble person only engages in honest and respectful relationships! Any other relationship is either born out of dire circumstances and necessity or is the most deplorable disgrace and insult to the potential faculties and principles of humanity!" Jean-Pierre Ady Fenyo, The Free Advice Man on all forms of relationships, 2009. I leave the door open just in case!" "Behind every less perfect copy there is a more perfect original." Jean-Pierre Ady Fenyo, London, UK, 2009. "Not all free advice is good advice...and not all good advice is free, but my good free advice is really good and absolutely truly free!" "Those whose dream lives are made at the expense of the nightmarish lives of others have no idea of how good it feels to make the dreams of others come true." Jean-Pierre Ady Fenyo, Budapest, Hungary 1994. "Those whose dream lives are made at the expense of the living nightmares of others are slaves to their own senseless lies and have no idea of how good it feels to help others make their dream lives come true!" JP Fenyo, Philosopher, aka The Free Advice Man; final version! "The main reason why we can never go back in time is because by doing so everything, and I mean everything, would have to change in the previous future. Obviously that's impossible, because there is only room for only one infinite universe!" Jean-Pierre Ady Fenyo, New York City, NY 2007. "I do not have a problem with the idea and potential reality of a Unified Spiritual Entity we might call G-D, but the idea that any one religion is the only true way to try being at one with G-D makes no sense, as G-D would have to be too cruel to fail to convince us which religion would be the right one! The very fact that there is more than one religion is proof enough for me that not one is totally the right one!" Jean-Pierre Ady Fenyo, Washington, DC, 2000. "Nowadays I often find myself waking up not on the wrong side of my bed, but on the wrong side of The UNIVERSE! I mean; this world is NUTS!" "Part of the WORLD is like a GIANT CLOSET! You can't even open it to see what's inside it without being crushed to death by what comes out!" "Those who do not do what they do not do do not do what they do not do, but those who do do what they do do, do not do what they do not do!" "By all means ROCK THE BOAT, just DON'T SINK IT!" - JP Fenyo, The Greatest Original New York City Free Advice Man in The World! "Part of the World is like a GIANT CLOSET! It's so BIG you can't even open it to see what's inside without being crushed to death by what comes out!" "A Truly Wise Society is a Really Ethical Society!" "People who are living in denial should get of denial, because the crocodiles are likely to eat them!" "Just as sometimes one must walk further up a river's bank to spot an island close enough to safely swim to and from there to the opposite bank; sometimes one must go somewhere seemingly totally unrelated in order to get to where one ultimately intended to get to!" - J.P. Fenyo, Philosopher (alternate version). "Life is its own meaning; the purpose of life is to enjoy the pleasures of living contrasted with its natural pains!" requests and offers. " JP Fenyo, The Free Advice Man. Laughter cures the aching and makes the belly ache! 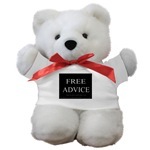 FOR MORE FAMOUS FREE ADVICE MAN WORDS AND IDEAS CLICK HERE! Remember, you may use my words, quotables and ideas, as long as I get name credit (author recognition) for them, and if used for substantial profit-making purposes only if we have a written agreement whereby I get my fair share on the royalties. Otherwise these words of mine are Protected by Copyright, All Rights Reserved. For proper name credit use this format: ( by or the words of ) Jean-Pierre Ady Fenyo, The Free Advice Man or Jean-Pierre Ady Fenyo, Philosopher, a.k.a. The Original New York City Free Advice Man. The Free Advice Man Website Content © J.P.Ady Fenyo; 2009 . All Rights Reserved. Site Manager Contact Here.